The 2018 Mazda 3, whether in sedan or hatchback form, is a car that simply excels in overall value in each category and can even still be had with a manual transmission for those performance buffs. Surprisingly, Mazda 3 is still fairly affordable with a MSRP starting just over $18,000. There are three model contrasts; Sport, Touring and Grand Touring. The 2018 Mazda 3 is available as a four-door sedan with a MSRP of $18,095 and a five-door hatchback version for $19,345. Grand Touring models of both the sedan and hatchback can come outfitted with a premium Equipment Package. This bundle is a grab bag of features across the board like lane departure warning, traffic sign recognition, navigation and a heated steering wheel to name a few. The design of the Mazda 3 is upscale and superior feeling without trying so terribly hard to be so, but the backseat remains somewhat cramped for rear passengers. The security features are spot on for the compact sector, however, the performance capabilities make the Mazda 3 standout from the competition. The Mazda 3, promoted as a thrilling driving machine, really proves itself to be authentic. So let us take a close look at why the 2018 Mazda 3 is so much fun to drive. The 2018 Mazda 3 comes with two difference engine options. The Mazda 3 Sport model comes equipped with a 2.0-liter four-cylinder engine that produces 155 horsepower and 150 lb-ft. of torque. By comparison, the base version Honda Civic sedan achieves 158 horsepower and 138 lb-ft. of torque. 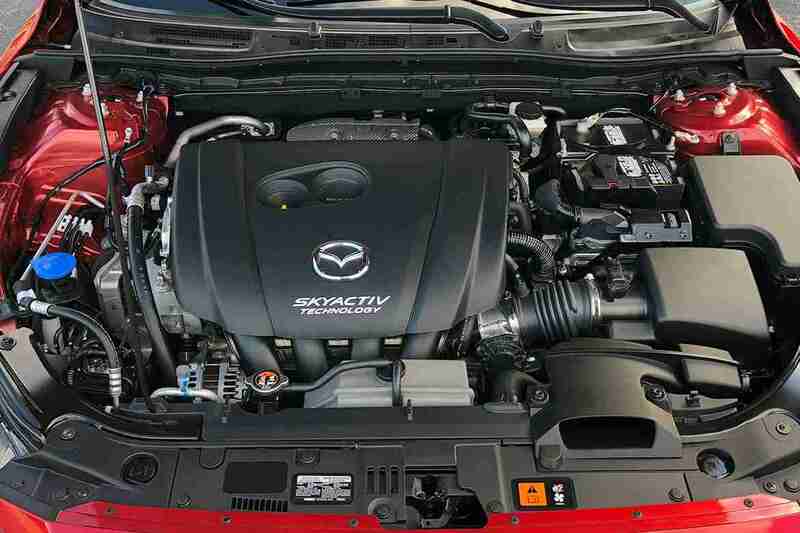 Touring and Grand Touring versions of the Mazda 3 have a lot beefier engine — a 2.5-liter, inline-4 that accomplishes 184 horsepower and 185 lb-ft. of torque. The two engine configurations may be mated to a six-speed manual or automatic transmission. Innovations with lighter materials and direct injection, higher compression engines help to assist the 2018 Mazda 3 in reaching a 37 mile per gallon fuel economy on the highway. One of the strengths of this 2018 Mazda 3 is with the steering and handling. Electric Power Assist Steering and G-Vectoring Torque Control make mincemeat out of curvy streets and provide a thrilling driving experience every time you get behind the wheel. Perhaps the alternative for an all-wheel-drive configuration would sweeten the pot for a lot of driving enthusiast, but for the time being, the Mazda 3 brings joy each time you drive with only a front-wheel drive option available. This 2018 Mazda 3’s exterior design is sophisticated and elegant, especially given its affordability. Once reason for the Mazda 3 has such beautiful lines is your KODO (style of movement ) design language which uses clay models to form the underlying inspiration for the layout details. And it just doesn’t look cheap in the premium metallic red pain finish. The Mazda 3 underwent a model refresh in 2017, so this version of the Mazda 3 will most likely stick around for at least a few more years. The hood sits low and the front grille seems to have a has an almost smile. Silver metallic accent panels sweep up from the air intake and become lost in the headlights. The front windshield sits back in the hood and the hatchback has a rear-wheel drive stance, though its own front-wheel drive only. The profile of the sedan and hatchback are quite similar with choices for 16-inch to 18-inch wheels. The hatchback’s fastback design looks more attractive than the sedan’s curved back. The Mazda 3 is among one the most affordable compact automobiles in the segment and it shows in regards to the materials used within the cabin. There is a hodge-podge of upholstery and paneling that tries to bake together a great-looking interior. The base version Sport has cloth-trimmed chairs, but the mid-level Touring model updates with black leatherette and a leather-wrapped steering wheel. The Grand Touring model brightens up the Mazda 3 inside with a red parchment leather interior. The instrument panel and center console angle toward the driver, but the combination of a 7-inch touchscreen and push-button controls bed for modernization. Rear passengers in the hatchback or sunroof models will suffer the most on interior space, but there are worse vehicles on the market. For example, the Mazda 3 nearly doubles the overall passenger volume of the 2018 Chevrolet Volt. The rear passenger volume in the Mazda 3 might feel a bit cramped though with just 35.8 inches of rear legroom. Two rear seat occupants will fit comfortably across, but three rear bench passengers would be pushing the limit. The hatchback version makes the most of the cargo space and has 47.1 cubic feet with the rear seats folded down. In contrast, the sedan variant only gets 12.4 cubic feet of trunk space. Therefore, if carrying a bunch of your stuff around is your major selling point, choose wisely. A win for the 2018 Mazda 3 comes in the safety category. 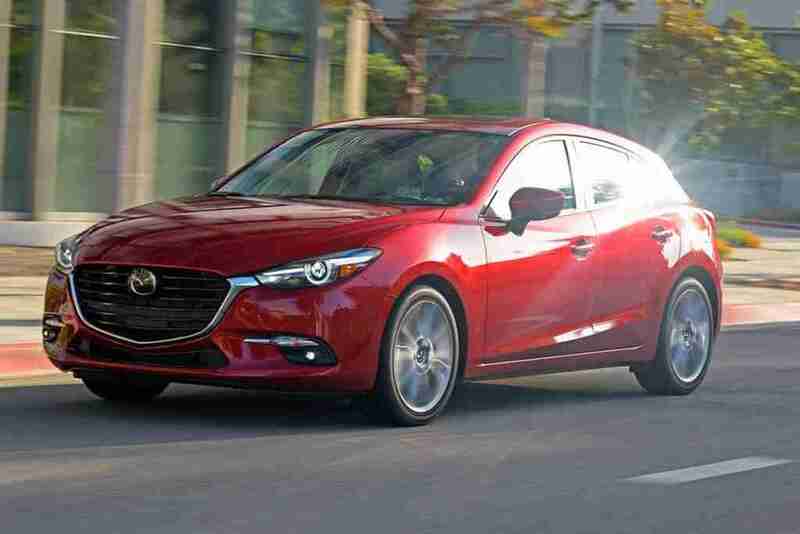 The Insurance Institute for Highway Safety (IIHS) called the Mazda 3 a Top Safety Pick and the National Highway Traffic Safety Administration (NHTSA) gave it an overall five-star rating in crash tests. Some notable standard safety equipment includes rearview camera and automatic emergency braking. The Grand Touring model has the best safety features that The Premium Equipment Package packs Lane Keeping Assist, Lane Departure Warning and Smart Brake Support to name a few. Even the base Version Mazda 3 receives advantages from such passive security measures as a collapsible steering column and brake assembly, whiplash-reducing chairs and a full complement of advanced stage air bags. The 2018 Mazda 3 is a compact vehicle that excels in concealing its defects. Sure, it’s a cramped rear seat and some less-than luxury materials within the interior space, but the Mazda 3 exterior design and functionality compensate for any less-than-appealing conveniences elsewhere. The 2018 Mazda 3 does not scrimp on standard equipment in the least, so you don’t need to venture into the higher version trims to have features like a rearview camera, keyless entry and a 7-inch touchscreen. It is affordably priced to compete with the Honda Civic or Toyota Corolla. It doesn’t attempt to mimic the qualities of these best-selling vehicles. The Mazda 3 is a standalone compact with its distinctive take on the driving experience.